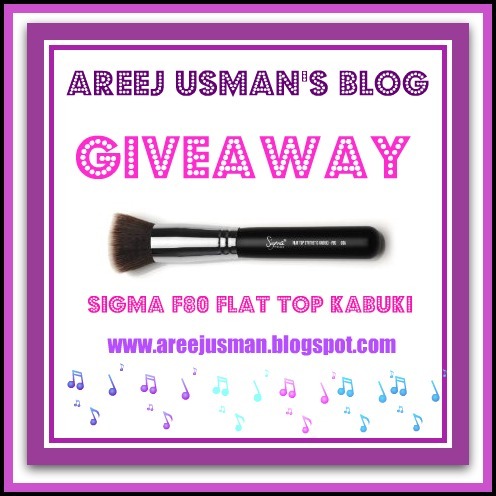 Sigma is giving away the Best seller F80 Flat Top Kabuki Brush to one of my followers….Isnt It A Great News!! This exclusive flat top synthetic kabuki was designed to deliver a flawless makeup application. The Sigma Makeup F80 is a buffer brush that can be used to blend powder or liquid products. This Giveaway starts today on the 10th of May 2011 & will end on 31st of May 2011. Sigma Beauty will ship the product to the winner.Visit Sigma Beauty here. hope and pray to win 🙂 in sha Allah. facebook name: sadia usman chaudhry and sadia reese. So i double liked it! Enter me 🙂 I am followin you! Following you on Twitter @Rabeeyah. I am following you through GFC as Rida Rohail. I like your facebook page as Rida Rohail. following on twitter with sanamuqtadir….. Thank U Girls for participating .